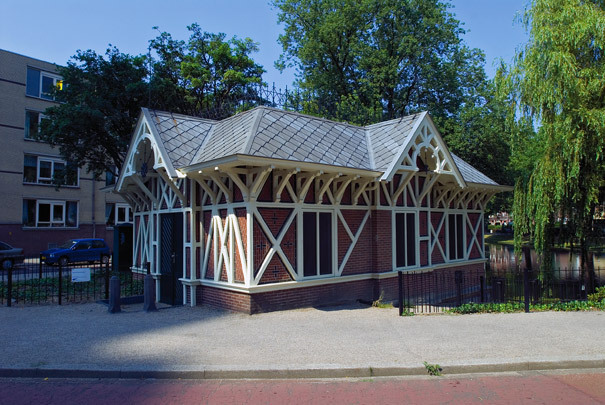 This 'filth-dredging hut' on Boezemsingel marks the visible outer limit of the Water Project (A007). At this point the tree-lined singels continue as an underground system of pipes leading to the pumping station at Admiraliteitskade. The hut contained a grating for the purpose of 'fishing out the filth deposited at the grating in front of the suction pipes and disposing of it without stench in well-sealed carts.' The small symmetrical pavilion is in ' Swiss chalet' style with a timber framework and stone plinth. The interior was just a bare room with manhole covers in the floor to get at the sewer.